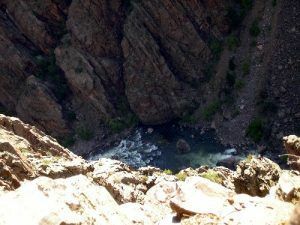 Sheer black walls plummet up to 2,700 feet along the 53-mile stretch of Black Canyon’s narrow gorge. The spectacular landscape, formed over millions of years by the raging river below, combines its narrow opening, sheer walls, and startling depths like no other canyon in North America. Located in west central Colorado, one of America’s newest National Parks was long known to the Tabaquache Ute Indian bands hundreds of years before explorers came upon the obscure and amazing geographic feature. The Spanish were the first Europeans to roam Colorado’s vast mountains and valleys in 1765 when Juan Rivera’s band of explorers was looking for a passage to the California coast. Passing by the canyon, they were followed by another Spanish expedition 11 years later. By the early 1800’s fur trappers were roaming through the canyon in search of game, but it wouldn’t be for another fifty years that the canyon would be officially explored. In 1853 Captain John W. Gunnison led an expedition through the area, searching for a possible transcontinental railroad route. 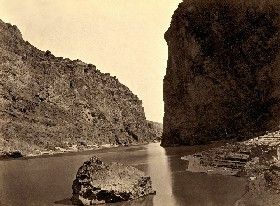 Daunted by the demanding terrain, Gunnison proclaimed the rugged country as totally unsuitable for a railroad and moved on into Utah, where he and all but four of the eleven members in his group were killed by a band of Paiute on October 26, 1853. 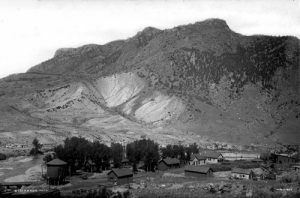 Later explorers agreed with Gunnison about the rugged terrain of the area and no hopes of building a railroad, that was until rich mineral deposits were discovered on Colorado’s western slopes. Once again, surveyors and engineers began to search for railroad path through the daunting canyon. By the early 1880’s, the Denver and Rio Grande Railroad was on its way west across Colorado and before long, the company began the challenge of blasting and carving a narrow gauge railroad from the hard rock walls of the Black Canyon of the Gunnison. A feat previously considered impossible, in August of 1882, the first Denver &Rio Grande train rolled out of the canyon and into the construction camp at the end of the tracks on Cimarron Creek. The construction camp called Cimarron, made up of nothing more than tents and a single log cabin, grew into a railroad town by the end of the year, complete with a roundhouse, station facilities, several businesses, the ever-present saloons, and more than 300 people. The engineers that took trains through the Black Canyon for the next 67 years were extremely fearful of the route – especially during winter when avalanches and rock falls were common and an engineer and his crew never knew if or when their train would be the next to be swept into the icy waters of the Gunnison River. Despite the dangers and constant repair work, the Denver and Rio Grande made its Black Canyon route the cornerstone of its “Scenic Line of the World” passenger promotions and featured the Curecanti Needle on its emblem. Though railroad’s main purpose was to provide shipping of the area mine ore, by the turn of the century, it was also running scenic excursions. A subsidiary of the D&RG, the “Rio Grande Hotel Company”, established the “Black Canyon Hotel and Eating House,” which quickly became known for its excellent hospitality. After mining decreased in the area, the town’s population began to dwindle, but area cattlemen continued to gather at Cimarron to ship their cattle and sheep to market via the Denver and Rio Grande Railroad. However, this too would change as trucks began to haul the cattle and Cimarron’s rail yards and corrals sat empty. The last train to run from Gunnison to Cimarron along the tracks through Black Canyon was a scenic excursion in 1949. Shortly after the last train made its scenic journey, the rails, ties, and corrals were removed. Since then the depot, roundhouse, hotel, saloons, ice plant, and individual homes have also disappeared from the old Cimarron town site. Today, the National Park service maintains a visitor center, campground and picnic area where the original town once stood. There is also an exhibit of authentic railroad cars that interprets those bygone railroad days. Just a short drive north of Cimarron are the remains of the last standing D & RG Narrow Gauge Trestle crossing the Cimarron River. This relic to Cimarron’s past is listed on the National Register of Historic Places and sports the genuine Engine 278, coal tender, a boxcar, and caboose that was used on those many trips through the Black Canyon. Cimarron is located just south of the Black Canyon of the Gunnison National Park and just west of the Curecanti National Recreation Area. On March 2, 1933 the steep canyon was made a National Monument. On October 21, 1999 10,000 wilderness acres were added to the Black Canyon of the Gunnison and its status changed from a national Monument to a National Park. Within the 14 miles that lie within the park visitors will see dramatic views of the craggy canyon walls, glimpses of the swift river running more than 2,000 feet below, as well as a plethora of wildlife, including elk, bear, deer, wild turkey, big horn sheep and hundreds of varieties of birds. The park also offers a number of hiking and biking trails, cross country skiing, fishing, camping, and horse back riding. The main attraction of the park is the scenic drive along the south rim which is located about 15 miles east of Montrose, Colorado via U.S. Hwy 50 and CO Hwy 347. The north rim, which is closed in the winter is about 11 miles south of Crawford, Colorado, via CO Hwy 92 and North Rim Road. The river itself can be accessed by a steep, un-maintained trail that takes about 4 hours to hike down and 6 to hike back. 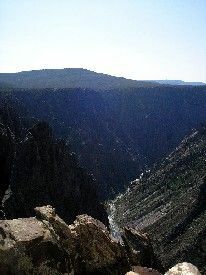 The Black Canyon of the Gunnison is approximately 60 miles southeast of Grand Junction, Colorado.